This article is about the character. For the guest star, see Neil Patrick Harris. Neil Patrick Harris is an American actor, director, magician, and musician. 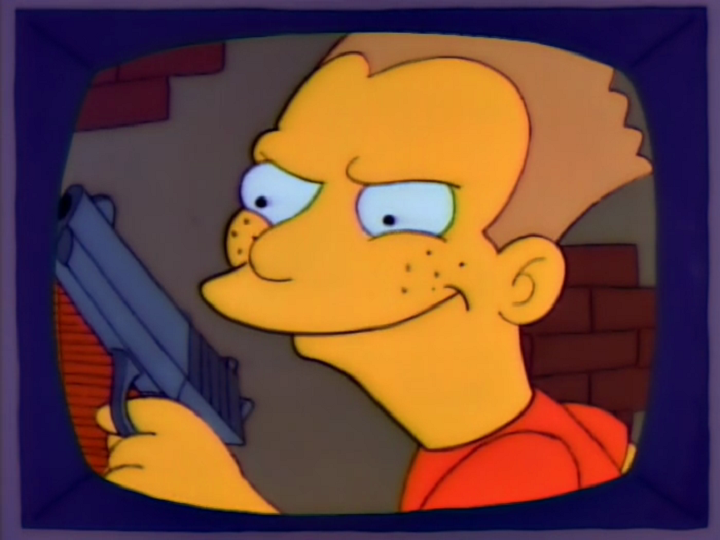 He played the role of Bart Simpson in the made-for-television film Blood on the Blackboard: The Bart Simpson Story. The film announcer introduced him as "TV's Doogie Howser". In sharp contrast to actual events, the films depicted Bart murdering Principal Skinner in cold blood while a frightened Fat Tony tried to talk him out of it. "Flaming Moe": After Moe makes over his bar into the gay-friendly "Mo's", he owns a dog named Neil Patrick Hairless (punning Harris's name). "Homer the Father": While watching the Tube Town television channel, Homer sees a show called Supreme Courtney, which is a spoof of Doogie Howser, M.D. At the time "Bart the Murderer" originally aired, Harris's best-known role was as the title character in Doogie Howser, M.D.. He has since enjoyed a successful acting career and in recent years his most prominent role has been starring in How I Met Your Mother. Modified on April 11, 2016, at 00:45.